So a while back ago I realized that having cats and Christmas trees kind of sort of sucked. I remember coming home to trees in the middle of the living room floor, glass ornaments shattered in bits that would terrorize the bottoms of my feet for weeks. Because, you know, broken glass hides and then comes out of nowhere 2 weeks later. 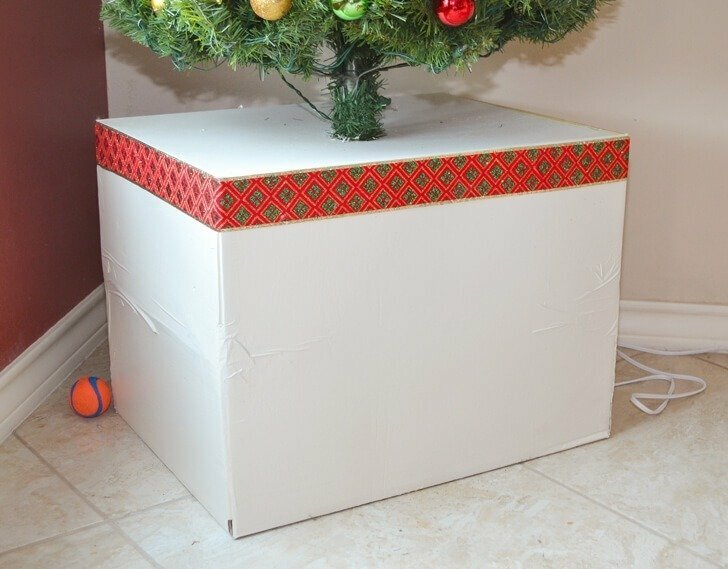 So I devised a way to keep my tree a bit sturdier by wrapping up the base in a box. And it worked really well. But this year Rob and I have a 9 foot super skinny tree that is also super fabulous. We thought it would almost reach the tall ceilings in our house but we must be terrible at this sort of thing because it was a good 3 feet below the ceiling when I got it set up. So, I wanted to add more height to my tree and make things even more sturdy than they have been in years passed. In the end, I’m super happy with my result and my tree is right at the height we wanted it and there’s no tipping that sucker over without a lot of momentum. And it’s pretty. 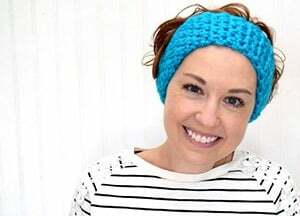 So very glittery and pretty! First thing you’ll need to find a box that is a good size for your base. For mine that was a size large moving box from Duck Brand at Walmart. Since we just moved I used a box from the garage but they also sell heavy duty boxes that probably would have been even better. 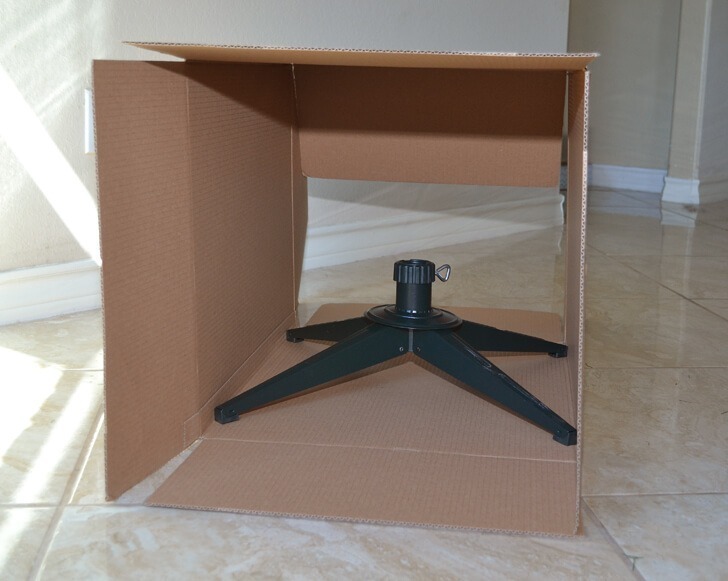 Place the box on its side with the open ends on the right and left of the stand. 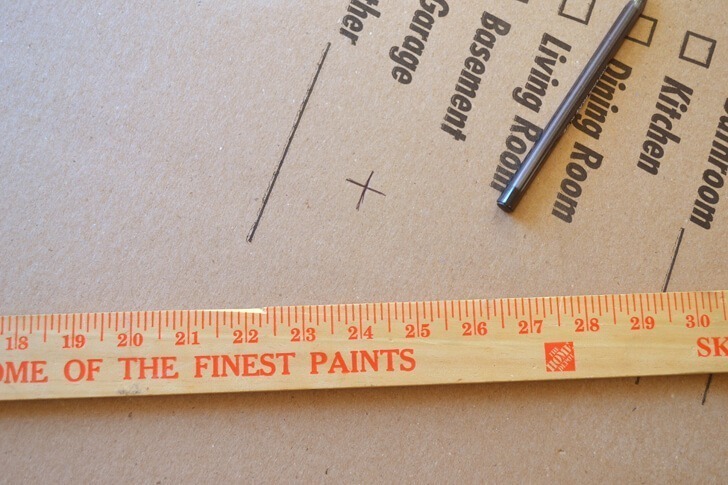 Measure out the center of the box. 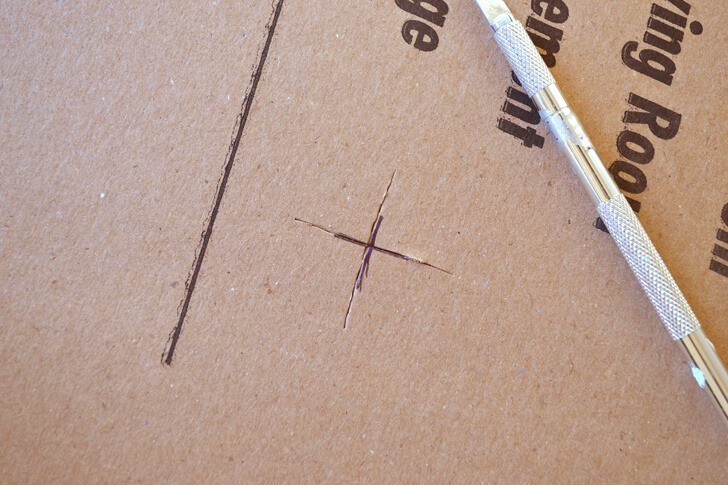 Cut a deep “X” with a craft knife. Shove lots of heavy things like books or cans of food or even bricks into the box and underneath your base. My first plan was to use big juice cans but then I realized I don’t have those :) Instead I got a bunch of Mr. Smartie Pants Rob’s art books and just kept moving them around until I got them mostly level. If you can’t get it perfect, use a few pieces of cardboard or even plywood to help even things out. 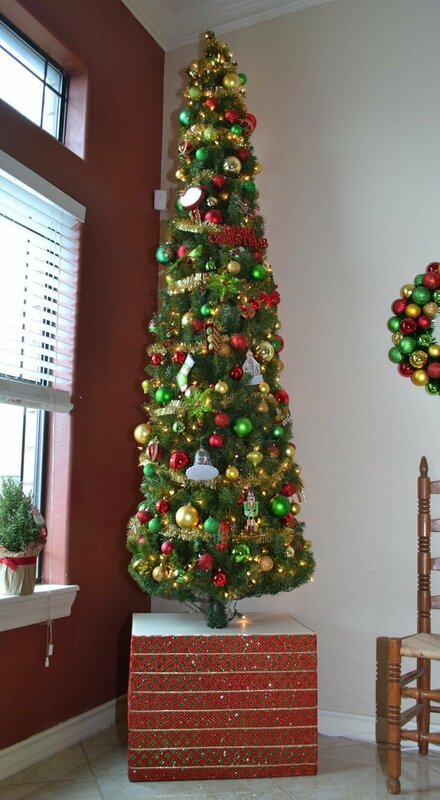 Place another piece or two on top of the now level area and toss your tree base on top. Push the cord for your tree if prelit through the X shape you cut and into the tree stand. Slide the tree pole in until it seats into the base. This seems like it would be difficult but I did it all alone so it’s totally doable without help. Cut a small hole on the back of the box and pull the plug through. 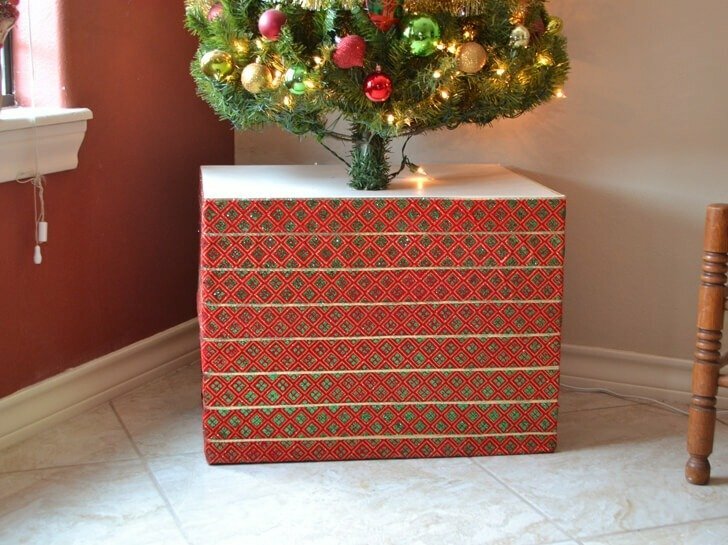 Tape the sides of your box shut (after double or triple checking that the base is in fact sturdy and level) and decorate as you see fit. Now as it turned out wrapping up a box this big and heavy with something sticking out of the top of it is a royal pain in the rear. I tried. I failed. 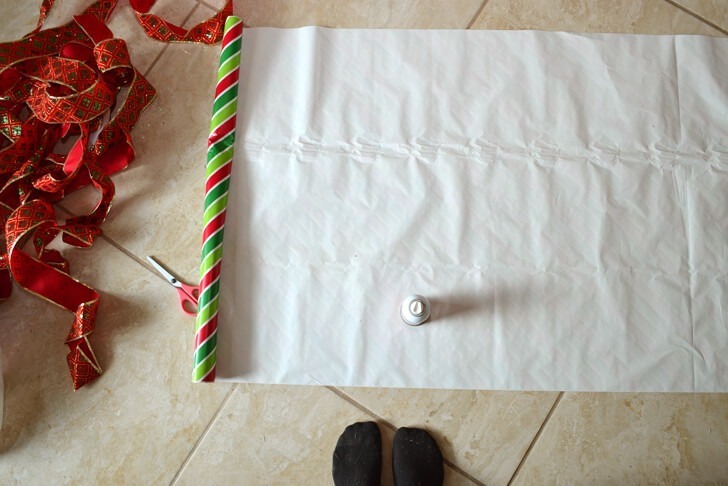 Using something to protect your floor (like maybe wrapping paper that didn’t pan out) and get your spray adhesive ready. 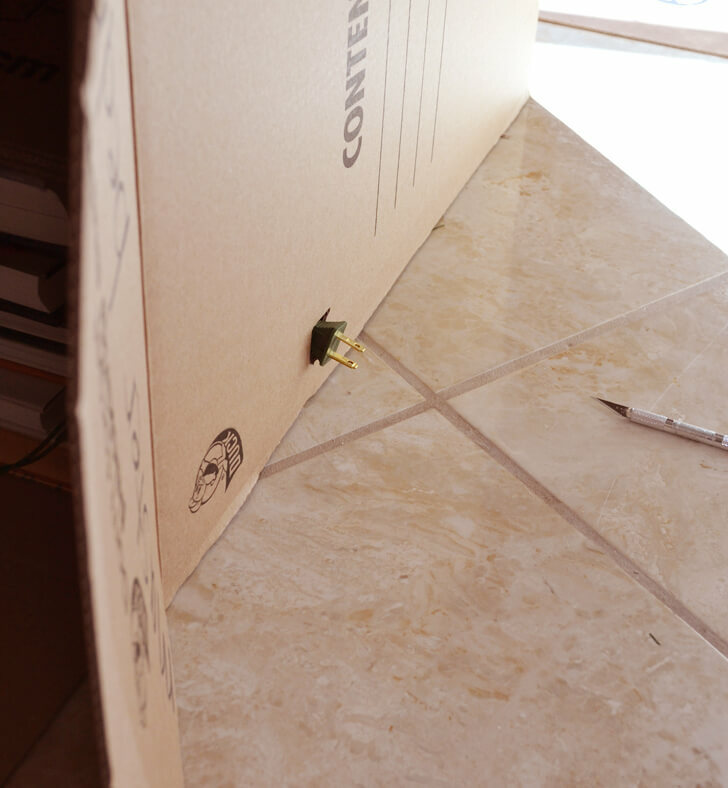 Take long lengths of ribbon and cut to fit from the back to back so that it covers the sides and the front of the box with just a little hanging over onto the back. Now this ribbon was going to be used for lovely tendrils coming down the tree but it looked like me as a kid after my Mimmie painstakingly curled all my hair and I ran around like a freaking banshee and sweating and swinging my lovely curls out. In other words it was these awful, saggy things that didn’t want to hold their shape at all. So they got scrapped but found this new use. So yay for a decent plan b! Allow the spray adhesive to become tacky and then attach to your box taking care to make the ribbon nice and straight. Do your best to smooth the ribbon as you go. There will probably be an occasional wrinkle and that’s just the way it goes. If you’ve got a decent pattern going you probably won’t notice much, if at all. You can layer the ribbon or place each piece flush, side by side. I went with layered since mine had been curled up and manipulated and didn’t want to lay down perfectly straight for me. If you look closely you can see that the lines aren’t perfectly straight and there are wrinkles, especially on the upper right hand side but if you don’t look for them you don’t see them. I think this is also probably because when I taped my box shut I went kind of crazy with the tape and there were wrinkles there already. Now look at that! The lovely green glitter shines and twinkles with the lights and both Rob and I love it more than just the painted box. We kept it that way for a while but in the end we decided that a little bit flashier was a little bit better! Again, this is going to help hold that tree straight up even when you have cats that are all about climbing that thing. That is unless your cats are very determined, or perhaps very heavy. So I guess it’s not perfect but this sturdy Christmas tree base cover is definitely a heck of a lot better than nothing at all! 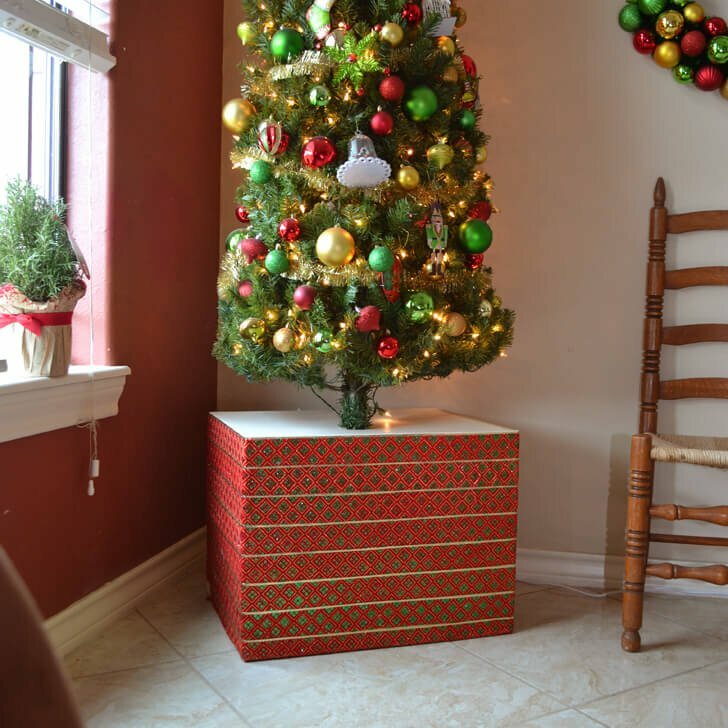 If you’re interested in reading about how our Christmas tree and decor came to be, check out this post here and if you want to hide your Christmas tree base with a gift that is a lot simpler, check out this post here. Thank you for this brilliant idea! I don’t need height but I do need a way to stop my 4 adorable cats from climbing my tree. Once I’ve done the box per instruction (and having the heavy base will be invaluable for tree/cat safety) so I don’t have an inviting platform under the branches for sleeping on I’m going to cut thick card (probably another box) into 2 strips long enough to go right around box (or join strips) then make zig zag (spiky mountains) on both strips but leave at least 2″ deep border at the base. Decorate as required. Score (do not cut through) 1″ from bottom and fold so that zigzag stands up with folded area as base. Using stick on velcro, attach zigzag (mountain) to very edge of the box top right round. Now using velcro again attach zigzag to front of box so zigzag points out, box has a pointy collar. Still room for prezzies under the tree but not comfortably accessible for kitties. For storage remove spiky collars and reposition so they lay flat on box. 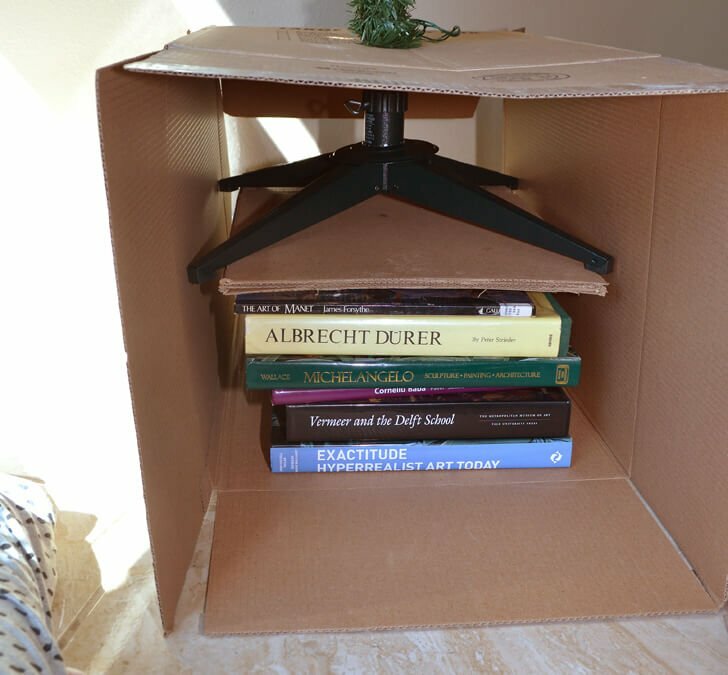 Could you wrap the box before you put the books and stuff in it and just leave one side folded as a flap and then tape it? I have actually done that a few times but I always see the seams. 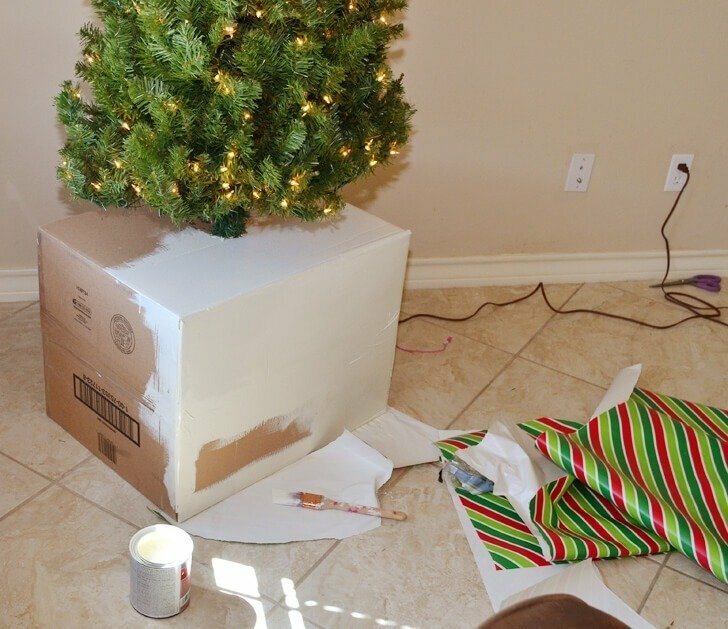 The best I did was I took the box and attached the gift wrap with spray adhesive and then made the box around the tree as usual. It can be done!